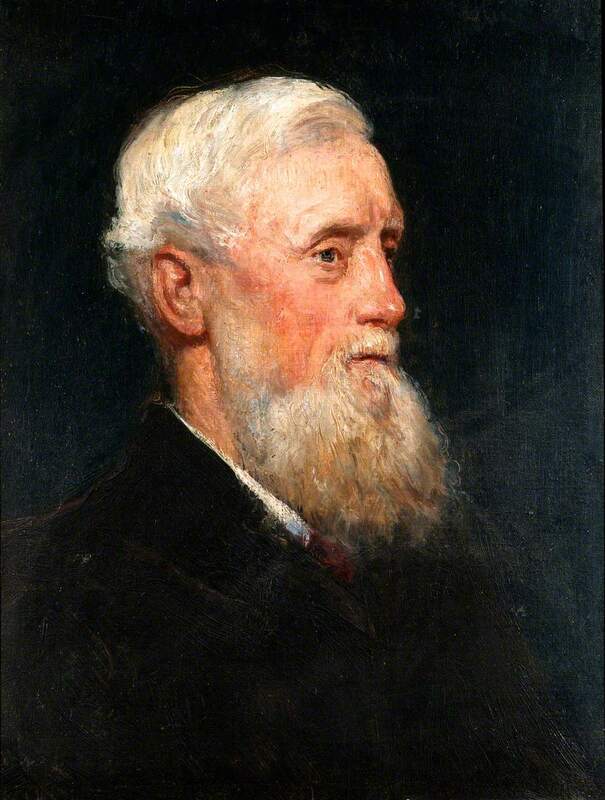 John Pollard Seddon (1827-1906), Architect of Old College, by Hans Olaf Heyerdahl (1857-1913) — given to Aberystwyth University's School of Art Museum and Galleries by Seddon's grandson in 1979; reproduced here by kind permission of the School. John Pollard Seddon (1827-1906) was an intellectual who moved in Pre-Raphaelite circles. He was the younger brother of Thomas Seddon (1821-1856), a close friend of Holman Hunt (1827-1910) — one the founders of the Pre-Raphaelite Brotherhood and painter of The Light of the World and The Awakening Conscience – paintings which we may now appreciate for their quaintness, but in their day aroused real emotion. Seddon's own impeccable Pre-Raphaelite credentials are to be seen with his design for the first major piece of Morris, Marshall, Faulkner & Co furniture – this was for his own draughting and office desk. It is known as "King René's Honeymoon Cabinet." It had painted panels by Ford Madox Brown, Rossetti, William Morris, Burne-Jones and Val Prinsep. It can be seen at the Victoria and Albert Museum. Seddon was also a prolific designer of stained glass – some of his windows, mostly in Wales, are among the finest Pre-Raphaelite ecclesiastical works. Seddon had been articled to Professor Thomas Leverton Donaldson (1795-1885). With C. R. Cockerell (1788-1863), Donaldson was one of the last links with the eighteenth century British classical tradition. He was a founding member of the Royal Institute of British Architects and was spoken of as a "father of the Institute and the Profession." Although distinguished as a writer and a teacher, Donaldson built comparatively little. He was a classicist to the core – his projected design for the Albert Memorial and an adjacent Hall of Science show a fine command of the orders and classical monumentality. Like many young architects, Seddon had been stirred by the writings of Ruskin, notably The Seven Lamps of Architecture (complete text) (1849) and The Stones of Venice (1852-53). In 1852, the age of twenty-five, Seddon published Progress in art and architecture... It was based on series of lectures he had given at the Architectural Association, that had been founded in 1847 by young articled pupils who were dissatisfied with the banal historical and cultural diet they were offered by their architect mentors. Progress in art and architecture is filled with Ruskinian ardour. It is illustrated with ten fine lithographic plates by Seddon's own hand. These show the influence of Ruskin's impassioned style of drawing. There are no complete buildings in Seddon's book. Seddon, like Ruskin, was concerned with intimate and humanising ornamental detail [...]. Seddon himself created fine ornament throughout his career and his many Pugin-like designs for encaustic tile schemes for churches are among the best of the 1860s and 1870s. [...] — Stuart Durant, excerpted from "Voysey and His First Mentor, John Pollard Seddon"
Blackshaw, Tye R. "Seddon, John Pollard (1827–1906), architect." Oxford Dictionary of National Biography. Online ed. Web. 25 November 2016. "Church of St Catherine." Historic England. Web. 25 November 2016. Jenkins, Simon. England's Thousand Best Churches. Rev. ed. London: Allen Lane, 2004. Pevsner, Nikolaus. Herefordshire (The Buildings of England series). London: Penguin, 1963 (2001 reprint). Seddon, J. P. Progress in Art and Architecture: with precedents for ornament. London: D. Bogue, 1852. Internet Archive. Contributed by Getty Research. Web. 25 November 2016. Sladen, Teresa. "Byzantium in the Chancel: Surface Decoration and the Church Interior." In Churches 1870-1914, the Victorian Society's journal, Studies in Victorian Architecture & Design. Vol. III. 2011. 81-99.